My name is Leticia, and I have been serving CFCA for more than eight years. It is early in the morning, and I get up thanking our Lord for another day of life. I put my life in His merciful hands as I prepare a cup of coffee. To be part of the CFCA team has been an immense blessing for me. We feel that what we do is not just a job: it is a mission in our life. I get ready to visit communities in the morning and to distribute benefits in the afternoon. Today we will visit the communities of Desamparados, Los Alpes and La Managuita. In our home visits, we offer hope and dignity to all our sponsored families. This is why, early in the morning, we arrive at the community of Los Alpes. 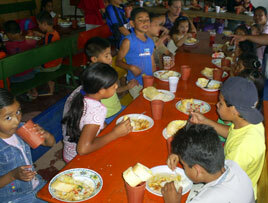 With the help of the mothers, we prepared breakfast for a little over 100 sponsored children and, while we do that, they all are talking about the trip to the water park they enjoyed last week. They had the opportunity to share with their friends and to enjoy the pools, horse rides, trails, etc. We had 12 buses full of smiling angels who waved at anybody who would look at them. To get out of their violent and aggressive communities and to be able to enjoy a healthy environment has a great meaning and value for them. While we were with the children, we were notified that one of our sponsored elderly, Jose, had lost his home and belongings in a fire. Apparently robbers broke into his house the night before, while he slept at his relativesí, and decided to burn it to erase any evidence. We went to visit Jose and found him sadly looking through the rubble of his house and remembering his 50 years of marriage. Jose lost eight guitars he handmade. ìThe material things burned down but the formula to make my guitars cannot be taken away, it is saved in my memory,î Jose told us. Amidst the pain, it is incredible to see the solidarity of the sponsored families in the area who were already trying to find clothing and goods to help Jose. CFCA is already finding ways to support him, too. Later today we went to a very dangerous area, the community of Managuita. This is a precarious community, formed mostly by migrants from Nicaragua or Costa Rican citizens coming from the rural areas. At the center of the community, there is a small river that carries the disposals of other communities. 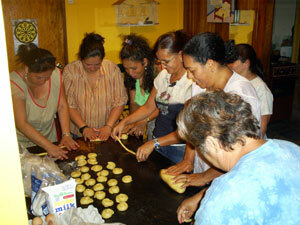 For our safety, we were accompanied by two, well-known sponsored mothers in the area, Maruja and Macha. The presence of these women is important because they are recognized and accepted by the local gangs. Todayís pilgrimage has enabled us to feel the family violence. A mother of sponsored children cried in our arms when she told us that her husband threatened to kill her earlier that day. We listened to her and told her how important she was in Godís loving plan, that she was a precious jewel as His daughter and that she can count on our support and the support of the other mothers in her community. Later that day, we had the opportunity to drink coffee with her husband. Knowing the reality of the family, we shared with him how violence destroys the family and those around it. It seems to me that, after the conversation, he reflected on what we discussed. Hopefully the family situation will improve. We truly hope to find options to support this family. There is a group of sponsored mothers who get together twice a week to make homemade bread to be sold among friends and neighbors. They call their group ìGod will provide.î This group is great therapy because many times, while baking, the mothers talk about their problems and how they can solve them. It is 12:50 p.m., when we arrived at the community of Desamparados, which is located in the suburbs of the city, holding great social conflicts such as poverty, unemployment, drugs, violence and death. These are dangerous environments for us but we trust God, who is protecting us, and our sponsored families, who cared for our safety. We distributed benefits this week. Cloth certificates are provided to the families so they can buy clothing. Some children tell us what kind of cloth they want; others donít know yet. They all are very happy and will make their final decision at the store. While distributing benefits, we already know that Damaris, mother of sponsored member Luis, will not be in our meeting. Her other son is in the hospital after being stabbed by local gangsters three days ago. When we found out about it, we sat with his mother for many hours after he was out of surgery. ìGod never leaves me alone,î Damaris said, with tears in her eyes. Indeed! The true calling of a CFCA social worker. Thank you for Leticia for your services towards the needy of this world. Gracias, Leticia, me siento orgulloso de conocerla personalmente y ser testigo de todo su increÌble trabajo en favor de su querida gente en Costa Rica, gracias por su ejemplo para todos nosotros. Very cool. Thanks for sharing. It’s always encouraging to read about people putting themselves last!